Natalie Hunsaker and Our Homeschool Project: Welcome Baby Heidi! Baby Heidi was born 10/6/10, at 9:55 PM, weighing . . . oh wait. Just kidding. If you thought THAT was a mean trick, imagine being in labor for 5 hours with contractions increasing in both duration and intensity of pain. 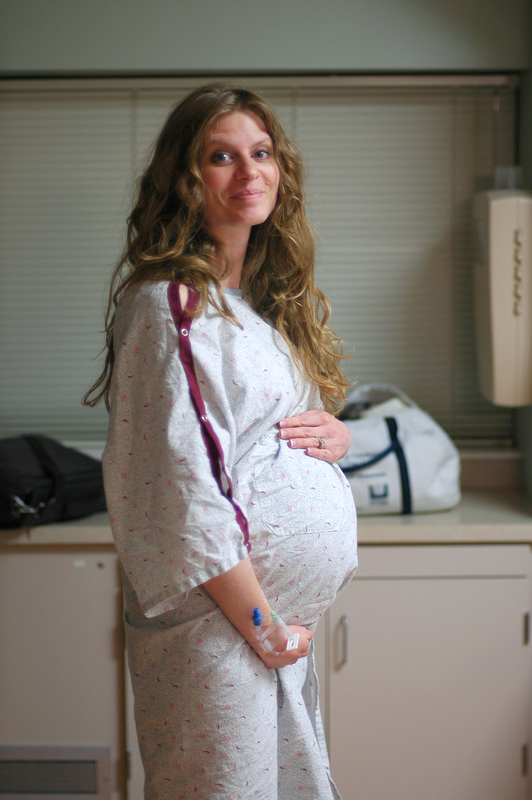 Imagine the triage nurse saying your bag of waters is "bulging;" and your labor/delivery nurse declaring you "imminent." Imagine Matt changing his flight and emailing his boss that he won't be in meetings the following day. Imagine him getting our video chat all set up, and Grandma B coming over to join the video party. Imagine employing your relaxation techniques, gearing up mentally for all a 33 5/7 weeker entails: 2ish+ weeks of NICU, CPAP, pumping, calorie supplementation for a couple months after coming home . . . etc. And then, magically, at 9:55 PM, imagine the contractions suddenly spacing out and becoming mild enough that you can crack jokes during them. The doc said if I were full term, they would have broken my water just to get it over with, but of course since I'm preterm they're happy to give me as much time as I can get. So now it's a little after 2 AM and I'm awake with a few more relatively strong contractions. Is she coming? Who knows . . . It was enough of a scare that the doctors are keeping me hospitalized just to see if it happens again tonight. Truthfully--other than feeling a little sheepish for thinking it was the "real thing" when it wasn't--I'm still happy for every extra day Heidi gets in Mommy's incubator. But, seriously, my uterus is weird. Okay, that was mean. But, as I was reading that first sentence, it just didn't feel right. Sorry you got all excited and prepped for the big event just to have it stop! Heidi is just holding out so Daddy can be there too! Sending prayers and good thoughts your way! Natalie, I almost died, okay not really, but it was a mean trick so I'm so sorry what a trick you got. Poor Matt with the whole changing flights and meetings thing--good thing he is so great so his company still likes him right? Such a mean trick!!! But I'm sure your uterus' trick was meaner. I'm so glad you're still pregnant. I just hope that Matt gets to be there, whenever it is. I was thinking, "Whoa look at you go with the posting right after birth!" and was only impressed. So glad the uterus decided to give you both a little more time in the current formation! Okay, your belly really DOES look big! And I'm not even trying to play along with your wishful thinking! :) Good luck! at work, so that title had me wondering where you went! So glad you got another belly shot in. You two look great!